Phil Chadwick's Art: #2117 "Harmony Beach Fog and Rain"
#2117 "Harmony Beach Fog and Rain"
Alberto was the first tropical storm of 2018. 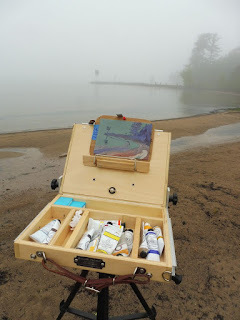 Alberto transitioned to a post-tropical cyclone about 20 miles southwest of Alpena, Michigan on Thursday morning - about the same time I was doing this painting. Under the right atmospheric conditions, tropical depressions and storms can maintain themselves hundreds of miles from their landfall point. With respect to Alberto, this system had a very large area of enhanced moisture to work with that extended from the Great Lakes to the western Atlantic and southward to the Caribbean. Alberto worked out the dry air that impinged on its ability to intensify over the Gulf of Mexico and created it's rather ragged appearance in the days leading up to landfall. When the fetch off the wind Lake Superior got longer the temperature dropped to 8 Celsius and the fog thickened into pea soup. Advection fog is a better indication of the real temperature of Lake Superior. The waters of the lake were probably around 4 or 5 Celsius. Much too cold for swimming. The warm and wet air mass with Alberto has created advection fog over the cold waters of Lake Superior. I thought the fog and rugged Lake Superior shoreline of Batchawana Bay would make for a possible painting. I took the Beach Road exit off Highway 17. I set up on the beach since it wasn't raining too hard at the moment. There were a few very small black flies. You would not even notice them until they sunk their tiny jaws into a your skin. It started to rain and the visibility improved. There was another row of pines further north along the shore that I had not seen when I started to paint. The fog was thick. It rained hard enough that I had to move to under the hatch back of the Forester. I finished that #2117 "Harmony Beach Fog and Rain" under the back hatch of the car in the pouring rain. It was 5x7 on the rough blue grey Masonite. The dew point was 16 Celsius which was the same as the car temperature.